Among her films are Federico Fellini’s La Dolce Vita (1960), after which she was considered a "rising star who exploded" onto the film world. She subsequently acted in Fellini's 8½ (1963), Jacques Demy’s Lola (1961), George Cukor’s Justine (1969), Bernardo Bertolucci’s Tragedy of a Ridiculous Man (1981) and Robert Altman’s Prêt à Porter (1994). She won the Golden Globe Award for Best Actress - Motion Picture Drama and the BAFTA Award for Best Actress and was nominated for the Academy Award for Best Actress for her acting in A Man and a Woman in (1966). The film "virtually reignited the lush on-screen romance in an era of skeptical modernism," and brought her international fame. Aimée was born Nicole Françoise Florence Dreyfus in Paris, France, the daughter of actor Henri Murray (born Henry Dreyfus) and actress Geneviève Sorya (born Durand). According to one historian, although some have speculated that her background may be related to Captain Alfred Dreyfus, this has never been confirmed. Her father was Jewish and her mother was Roman Catholic. She was raised Catholic but later converted to Judaism as an adult. Her early education took place at l'École de la rue Milton, in Paris; École de Barbezieux; Pensionnat de Bandol; and Institution de Megève. She studied dance at Marseille Opera; studied theater in England, after which she studied dramatic art and dance with Andrée Bauer-Thérond. Among her notable films were Alexandre Astruc’s Le Rideau Cramoisi (The Crimson Curtain, 1952), Federico Fellini’s La Dolce Vita (1960), Fellini's 8½ (1963), Jacques Demy’s Lola (1961), André Delvaux’s Un Soir, un Train (One Evening, One Train, 1968), George Cukor’s Justine (1969), Bernardo Bertolucci’s Tragedy of a Ridiculous Man (1981), Robert Altman’s Prêt à Porter (Ready to Wear, 1994) and, Claude Lelouch’s Un Homme et une femme (A Man and a Woman, 1966) — described as a "film that virtually reignited the lush on-screen romance in an era of skeptical modernism." Words like "regal," "intelligent" and "enigmatic" are frequently associated with her, notes one author, giving Aimée "an aura of disturbing and mysterious beauty" that has earned her the status of "one of the hundred sexiest stars in film history," according to a 1995 poll conducted by Empire Magazine. Because of her "striking features" and her beauty, she has been compared to Jacqueline Kennedy. Film historian Ginette Vincendeau notes that Aimée’s films "established her as an ethereal, sensitive and fragile beauty with a tendency to tragic destinies or restrained suffering." Her abilities as an actress and the photogenic qualities of her face, its "fine lines, expression of elation and a suggestive gaze," helped her achieve success in her early films. Among those were Pot-Bouille (1957), a story by Émile Zola, Les Amants de Montparnasse (Montparnasse 19) (The Lovers of Montparnasse, (1958) and La tête contre les murs (Head Against the Wall, 1958). Besides the French cinema, Aimée's career include a number of films made in Spain, Great Britain, Italy and Germany. She achieved worldwide attention in Fellini's La Dolce Vita (the Good Life, 1960) and Lola (1961). 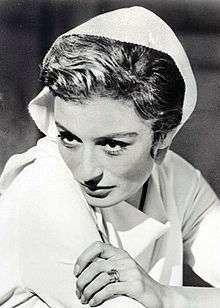 She appeared again in Fellini's 8½, and would remain in Italy during the first half of the 1960s, making films for a number of Italian directors. Because of her role in La Dolce Vita, biographer Dave Thompson describes Aimée as a "rising star who exploded" onto the film world. He adds that singer-songwriter Patti Smith, who in her teens saw the film, began to idolize her, and "dreamed of being an actress like Aimée." Aimée's greatest success came in 1966 with the film Un homme et une femme (A Man and a Woman,) directed by little known Claude Lelouch. Primarily due to the excellent acting by its stars, Aimée and Jean-Louis Trintignant, the film became an international success, winning both the Grand Prize at the Cannes Film Festival in 1966 and an Oscar. Tabery states that with her "subtle portrayal of the heroine—self-protective, then succumbing to a new love—Aimée seemed to create a new kind of femme fatale. . ." Film historian Jurgen Muller adds, "whether one like the film or not, it's still hard for anyone to resist the melancholy aura of Anouk Aimée." In many of her subsequent films, she would continue to play that type of role, "a woman of sensitivity whose emotions are often kept secret." Another American film, La Brava, starring Dustin Hoffman, was set to be made in 1984 but never completed. Hoffman at first decided it would play better if he were in love with a younger girl rather than the original story's older woman. "Where are you going to get a good-looking older woman?" he asked. He rejected Faye Dunaway, feeling she was "too obvious." A month later, after a chance meeting with Aimée in Paris, he changed his mind, telling his producer, "I can fall in love with the older woman. I met Anouk Aimée over the weekend. She looks great." He begged his producer to at least talk to her: "Come on, get on the phone, say hello to her. . . Just listen to her voice, it's great." In late 2013, the Cinemania film festival in Montreal, Canada, paid tribute to Aimée's career. In 2002, she received an honorary César Award, France's national film award, and in 2003 received an honorary Golden Berlin Bear at the Berlin International Film Festival. In the 1960s, Life magazine called her "the Left Bank's most beautiful resident," adding that "after each picture her enigmatic beauty lingered" in the memories of her audience. Aimée has been married and divorced four times. First to Eduard Zimmermann (married February 1949, divorced October 1950), secondly to film director Nico Papatakis (married August 1951, divorced October 1955), thirdly to actor and musical producer Pierre Barouh (married April 1966, divorced March 1969) and lastly to actor Albert Finney (married August 1970, divorced June 1978). She had one child, Manuela Papatakis (born 1951), from her second marriage. 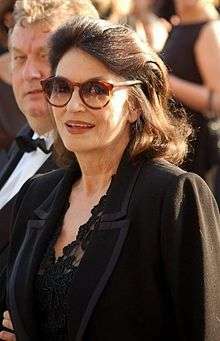 ↑ "Anouk Aimée" (in French). L'encinémathèque. Retrieved August 9, 2014.